OAKLAND — Throughout his life, Oakland resident Kenneth Levin displayed fortitude, resilience and the ability to adapt to the many changes and challenges he faced. A decorated veteran who served in the Vietnam War and rose to the rank of commander before failing vision ended his 15-year U.S. Navy career, Levin then transitioned well to the civilian workforce. He had a creative side, too. As an accomplished author in his later years, Levin had written and published three books since 2012. He was writing a fourth when he died Jan. 27 after a short fight with resurgent prostate cancer. Levin was 73. Levin recalled his 1968-69 service in Vietnam during a 2013 interview at his home for a local story tied to the publication of his first book, “Crazy Razor.” Ambushed twice while serving on a river assault group, the second attack caused Levin to fall into the polluted Saigon River, an event that many doctors believed led to Levin becoming legally blind. “It was like a biological soup,” Levin said of the river. Many also now believe this event, combined with exposure to other chemicals during the war, ultimately led to the cancer that claimed Levin’s life. “If it weren’t for the Vietnam War, he’d still be with us,” Fahr said. The idea for “Crazy Razor” existed for many years in Levin’s mind before he ultimately wrote and published it. Discharged from the U.S. Navy in 1981, Levin had hoped to start writing then. But married with two young sons, Levin went to work for 17 years in marine engineering and naval architecture. Afterward, he got into U.S. Merchant Marine advocacy, and then directed the business of the San Francisco bar pilots for a decade before retiring in 2009. Levin then fully delved into the next act of his life: writing. In completing “Crazy Razor,” Levin not only drew from his own war experiences, but returned to Vietnam for purposes of fact-checking and to get a better grasp of the conflict and life in general from a North Vietnamese perspective. Levin features two primary characters in the book, U.S. Naval Reserve Lt. j.g. Clark Coburn and North Vietnamese civil engineering student Tran Vo, and the effects of the war on each. Though fictional, actual events influenced Levin’s work. Emotions ran the gamut in “Comrade Binh” as Levin wrote of the sad, disturbing and aggravating as well as the very uplifting — dancing with his young granddaughter in the story, “La Bamba” — and even the downright funny, as in “Wanna Pahty?” where an on-leave naval officer and his wife unwittingly walk through a Bangkok red-light district. 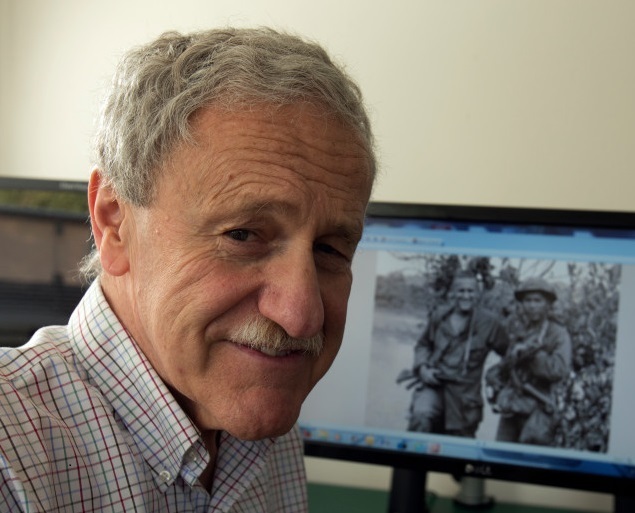 Levin published his third book in 2015, “Salami and the White Horse: A Brother’s Journey to and From a Doctor’s Vietnam War Diary,” where he transcribed, bolstered with explanations and additional research of his own, the diary kept in 1965-66 by his late brother, Ralph, an U.S. Army doctor in Vietnam at the time. For Levin, the work required patience and perseverance as deciphering Ralph Levin’s handwriting would have proven challenging to someone with even the sharpest eyesight — “his handwriting was witness to the old saw about doctors having lousy handwriting,” Levin wrote in the book’s preface — but the overall labor of love proved worthwhile. Kenneth Levin did not plan on graduate school after receiving his bachelor’s degree. But he still furthered his formal education to pursue many specialties in the navy, where he served as a ship driver, nuclear reactor operator and an engineering duty officer. Levin is survived by his wife, Eileen; two sons Ben (Sydney) and Danny (Edy); granddaughters Madeline, Ava and Goldie; two sisters Debby Stengel (Art) and Suzy Garrison (Rich); and many nieces and nephews. A memorial service with be held at a later date yet to be determined.